We have lovely neighbors, they made me dinner when I got home from the hospital with Mary, snowblowed our driveway (more than once) and perhaps most luckily think our slightly out of control animals are cute and charming (considering a few of our ducks spent the night in their almost-built house that’s a miracle). I wanted to put together a little gift to thank them but aside from them being the nicest people ever and that have a ton of grandchildren we don’t know very much about them. I was walking though target carrying a sled for Mary’s birthday and rapidly losing feeling in my arm when I spotted a display of pretty snowflake mugs. 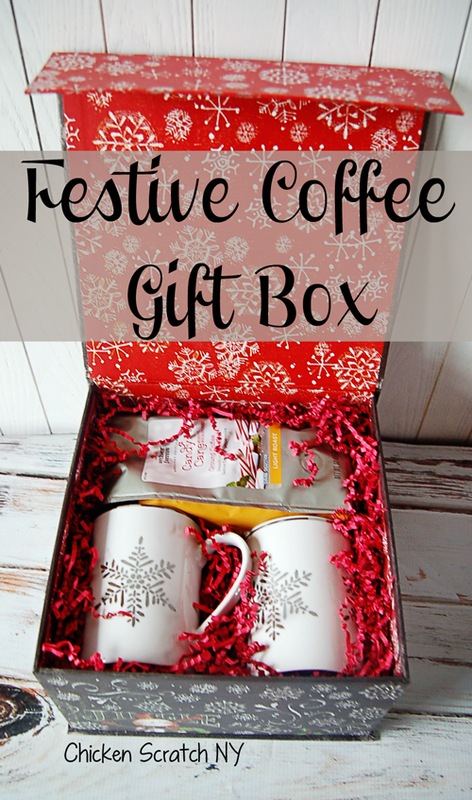 I decided to put together a small coffee gift box. My husband tells me there are people who don’t drink it but since my blood is approximately 75% coffee I don’t believe him. On the chance that they don’t drink coffee it’s the holiday season and they gets lots of guests (my dog Alfie won’t bark if someone pulls into our driveway but he lets us know when someone visits them) it’s likely that one of them will. Just like the Pancake Breakfast Gift Basket this is easy to personalize and easy to do without spending a lot of money.I’m not even going to bother with a play-by-play here, you’re all smart people and I’m sure you can figure this one out on your own haha! All you’ll need is a fancy box or basket, I went with a gift box from Michael’s and while I was there I picked up a bag of crinkle paper. I love boxes like this because they’re reusable and they make gift wrapping a snap. 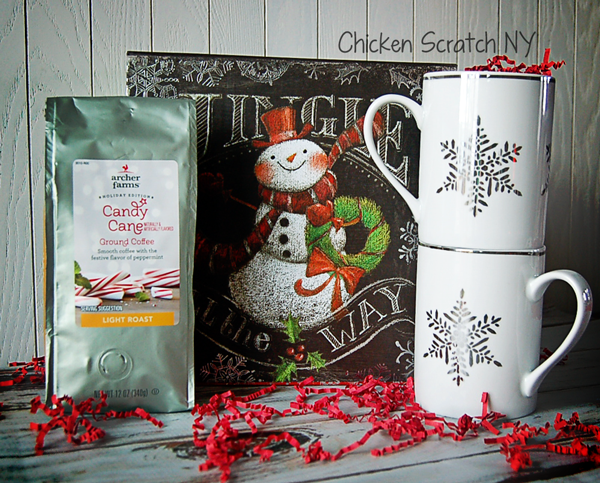 The mugs and coffee are from Target, I also bought a box of fancy biscotti but I couldn’t fit them in the box. You could always swap out the coffee for tea or hot cocoa, add in more mugs for a family or switch the whole thing to Bailey’s and shot glasses if that’s more your speed. Personally I’m all about the caffeine.